This jewelry armoire features seven drawers, two hidden side swing doors, and a lift-top compartment with a mirror. It is excellent for holding your precious belongings, such as jewelry, accessories, and other valuables. The three bottom pull-out drawers are larger, whilst the four top pull-out drawers are lower. This gives you the opportunity to find the right place for your jewelry and accessories. Are you looking for a new furniture piece to add to your room, so you can keep your jewelry and accessories organized? In this case, here is the right solution for you, which combines the functionality with the style. 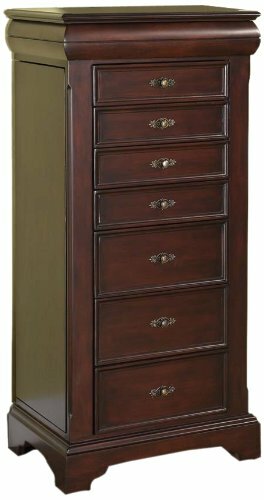 This Nathan Direct Lewis 7 Drawer Lockable Jewelry Armoire is exactly what you need. It is a truly wonderful piece that is ready to make you happy. It has a size of 13″ X 19″ X 40″, and it is constructed from high quality wood and MDF. This armoire features simple curves, antique hardware, and an antique brown finish. Due to its beautiful, elegant and classic design, this jewelry armoire is ready to enhance your room’s ambiance. The top part of this armoire has a lift top lid, which you can open to reveal the hidden top compartment. There, you can safely store your smaller jewelry and accessories, such as rings and earrings. Besides, when you open the top lid, you also reveal a built-in mirror, which you can easily use to get an accurate reflection of yourself, whilst trying on your jewelry, doing your hair or make-up. Measures 13″ X 19″ X 40″ and Weighs 82 Lbs. Arrives with Only Minimal Assembly Required. Equipped with 7 Drawers, 2 Hidden Side Swing Doors, and a Lift-Top Compartment that Reveals a Mirror and Ring Holders, the Jewelry Armoire Helps Keep You Organized and Clutter Free. Expertly Crafted and Constructed from High Quality Wood and MDF, the Standing Jewelry Armoire is Sturdy and Stable.